AutismWonderland: I Wouldn't Call You Selfish. But I Wouldn't Say You Understand Either. I Wouldn't Call You Selfish. But I Wouldn't Say You Understand Either. During my final semester as an undergrad student, I was sitting in my Greek Mythology class when a girl asked me for some of the answers on the 30 question study sheet the professor handed out the week before. She had the nerve to say, she didn't have time to answer them all. Side note: During this time I was working full-time, applying to graduate and having The Boy evaluated for Early Intervention. It had been the third time during the semester this girl had asked me for the answers to something. Which was annoying for many reasons but mainly because she had spent the first day of class bragging about how Greek Mythology was "her thing." Needless to say, she never asked me for another answer for the remainder of the semester. I mean really - she compared babysitting to being a mom. 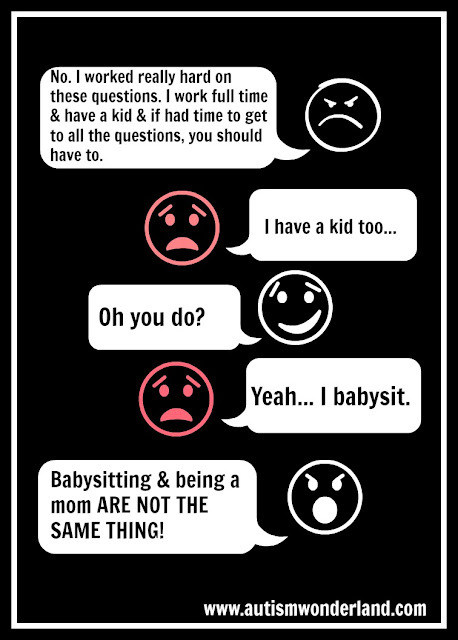 A babysitter gets paid. A babysitter gets to go home at the end of her shift. A mom's shift never ends. And last week I was in class and sitting between two women and the conversation turned to motherhood. Once again I'm the only one in the class with a young child. And one woman said, "It's annoying when my mom friends tell me I don't know what it's like to be a mom just because I don't have kids." The other woman said, "I know right! I mean, I can imagine. And I hate when they tell me that I live a selfish life." While I said I wouldn't dare call any woman who didn't have kids "selfish," I politely agreed that you can never know what motherhood is like until you're actually a mom. I don't think they appreciated that but it's true. Imagining life as a mom and being a mom are two completely different things. Because you can't possibly imagine waking up in the middle of the night, night after night to calm a crying kid. You can't imagine the amount of preparation it takes to run out for a quick trip to the market. Or having someone puking, peeing or pooping on you and just shrugging it off as no big deal. Or how quickly your heart stops when you think something has happened to your kid. And you can't imagine how good a hug can feel. Or how a smile can make your heart melt. Or the pride you feel when you see your kid do something for the first time. But it's so much more than that. Motherhood changes a woman. At least it changed me. Before The Boy, I occasionally imagined what motherhood would be like too. I had all these ideas about the kind of mom I would be and how I would raise my kid. Now I have a really good imagination. And I was wrong about almost everything.